She reminds me of Palette for some reason. None of these seem very Megaman-y to me. Huh. She kind of reminds me of Pallette, wearing that IHHQ outfit. Right down to the glasses Pallette wore when doing R&D. 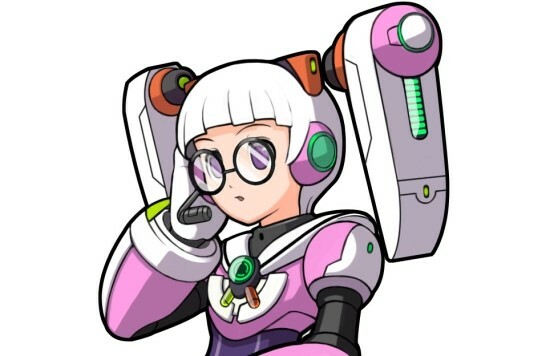 And now, we have a connection to the ZX/ZXA series with Irene. (totally implied, of course from the OP scenes) I'm loving that this games seems to pull mythology from everywhere and everything, as well. From a design point of view, that tangent on her shoulder should have never happened. And right when I was thinking how high-quality the artwork is. I'm sure this will sound absurd to some, but I can't get over how flat-chested her design is. Not because I want fanservice, but because it doesn't represent the human form very accurately, which I understand is a goal as long as they're making clearly male and clearly female robots. It's especially peculiar given that they took the time to make the neck and shoulder section represent a seifuku (japanese school female uniform). Reploid... parents? Since when do reploids have families? How do you have reploid parents? They're robuts. They are built by offscreen humans. They just happen to succeed on the account of this navigator? Overwhelming victories? I will laugh so hard if Irene here winds up being the final boss working incognito. Remember, the thing from the trailer did have two long extensions coming from the head.